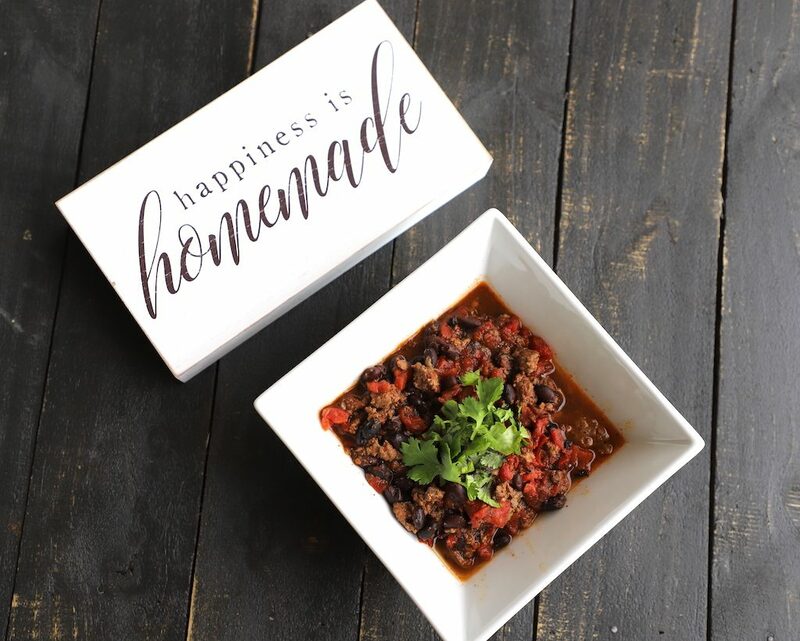 This Weight Watchers Slow Cooker chili is a perfect addition to your fix it and forget it Weight Watchers recipe collection! Don’t you love the feeling of putting everything in that slow cooker and letting it do the work for you? Okay, we do have to add the ingredients. And there may be a little chopping to do. But for the most part, this is the easiest way to get dinner on the table. 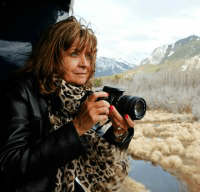 I love my slow cooker, and it’s not even one of the newer models! Have you seen what the latest and greatest slow cookers can do? This Calphalon Digital Sauté Slow Cooker does it all! You can sear, brown, sauté, and slow cook all in one pot. It makes life so much easier. I’m putting it on my wishlist! I do love that my 6-quart slow cooker from Crock-Pot has latches that keep it tightly closed for travel, and it’s easy to program. I guess it’s not that much work to brown the beef beforehand for this slow cooker chili, but I like not having an extra pan to wash. Which slow cooker do you have? Please tell me if I’m missing out on really cool features! 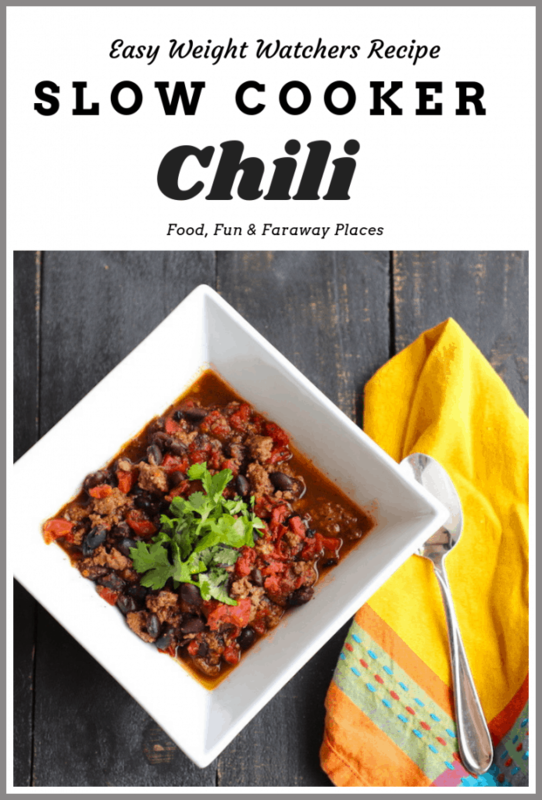 Enjoy this slow cooker chili recipe. 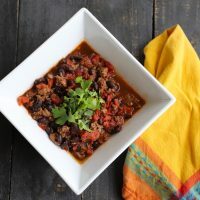 Easy slow cooker chili made for following the Weight Watchers plan. Brown ground beef in pan or in slow cooker if you have the feature. 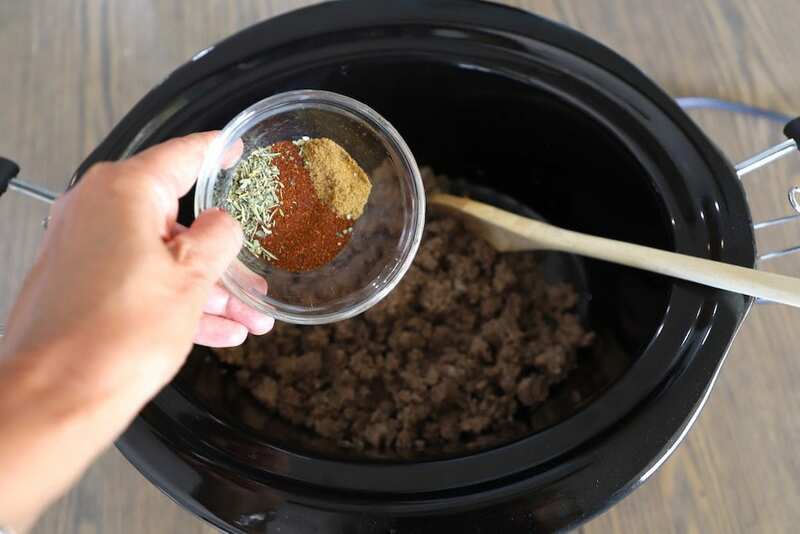 Add browned ground beef to slow cooker. Add chili powder, cumin, and oregano. Mix well. Continue according to your slow cooker directions, usually about 8 hours on low. 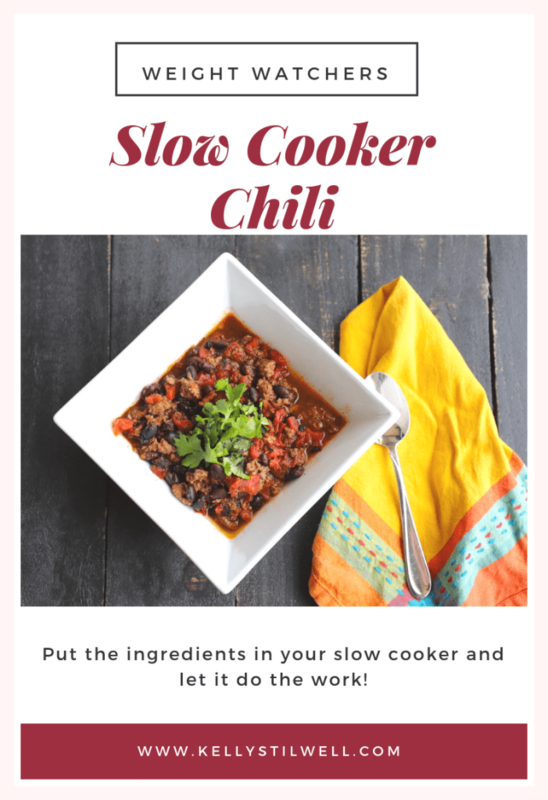 This slow cooker chili recipe is SO easy! Top with chopped cilantro just before serving. Remember to only chop the cilantro once! Chopping it more reduces the flavor. I learned that when a chef in Mexico taught me how to make this seafood salad recipe. Need More Weight Watchers Recipes? I’ve always liked Weight Watchers, so I’ve accumulated quite a few recipes. Start your day with these Weight Watchers bread recipes, perfect for breakfast. Think zucchini bread, banana bread, and more! This Thai Chicken Wrap is a wonderful lunch recipe. These chicken Weight Watchers recipes will give you a lot of options for easy and healthy meals your whole family will love. That’s the beauty of Weight Watchers. It’s real food everyone can eat. And if you’re gluten free, there are a lot of gluten-free Weight Watchers recipes, too. For those of you who don’t love chocolate (Wait. What?!) check out these Weight watchers desserts under 4 points! What’s your favorite Weight Watchers recipe? Share in the comments so I can try it, too!